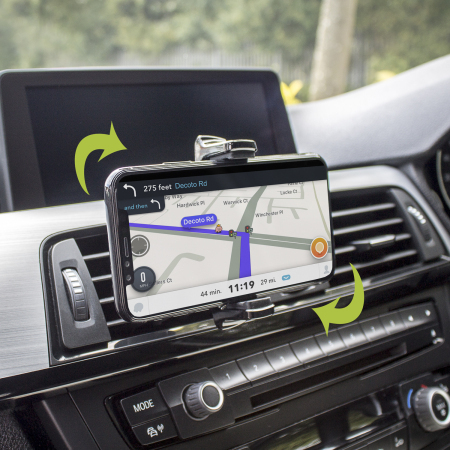 Keep your phone close at hand and safely in view while driving and having an unobstructed view of the road with the inVENT Nova Universal Air Vent Holder with one hand mounting & dismounting. Tight grip, good movement and ideal for most phones. This fits much better than I thought it would, it has a strong grip on the vent blades, holds my iPhone perfectly in both landscape and portrait positions. Great value and fast delivery, I’d definatley recommend this phone holder ???????? This holder is good quality and adapts to landscape or portrait. It fits the biggest phones even with a case in place, makes adding or removing the phone so easy, but it needs bracing against something to be wobble-free. This is the second Nova phone holder for my other car. Easy to fit stays in place holds phone even with the phone cover on would definitely recommend it. I bought this to use with my iPhone XS Max on the air vent of my Freelander 2. I was a bit concerned it might not fit as the vents are quite small and vertical - as opposed to horizontal like most cars. Also, I wasn't sure if the 'holders' would stretch and be wide enough to hold the iPhone XS Max. However, I'm happy to report that the the vent holder fits perfectly on the vents, stretches wide enough to hold such a big phone (including its case!) and it also has no problems carrying the weight of the phone. The perfect holder for me! It holds the phone well enough but if you put it in one of the central air vents the weight of the phone causes the vents to point down and therefore the screen of the phone points down. If you try to put it into the fixed vents beside the driver window the part that grabs the vent is just too short so it doesn't sit firmly. This is the only car vent phone holder that has ever worked for me. It holds the phone steady, is not intrusive on the dashboard and is simple to fit. I bought 2, one for an i10 and the other for a T6 - both excellent. Best phone holder yet holds the phone without taking it out of case. Easy to fit can hold it landscape or portrait. Well wort the price. works like a charm good bit of kit at a good price. Works OK but not particularly easy to get phone in and out especially without removing cover. Decent quality and does the job I bought it for. I tried to secure the in vent holder to the air vents in my van, but as they are the type that rotate and move up and down, they weren't ideal for securing it. It stayed attached, but tilted down with the weight of the phone in it. I managed to secure it to the narrow rigid vent near the quarterlight window. As the vent slats were thicker, it was a tight fit, but just stays on. Something to bear in mind when you get one of these type of holders. Amazing device st a reasonable price. I have been using this device now for a week. I can honestly say it does the job superbly. It is quick and easy to install and very well made. I am using it for my new Samsung Galaxy Note 8 which it holds very sturdily. One handed insert and removal of the phone is great in either vertical and horizontal position. I highly recommend this devive and totally trust it to hold my expensive phone. I've looked for a long time for a vent holder for use in my Honda CR-V. Others have slipped, drooped and just not been strong enough. Not this one. Clamps straight on to the vanes in the vent with a very strong clamp and the snap feature allows easy fitting of the smart phone. Thanks from one happy customer. Oh and a great price too.